By definition e-commerce refers to business and consumers buying and selling products online. 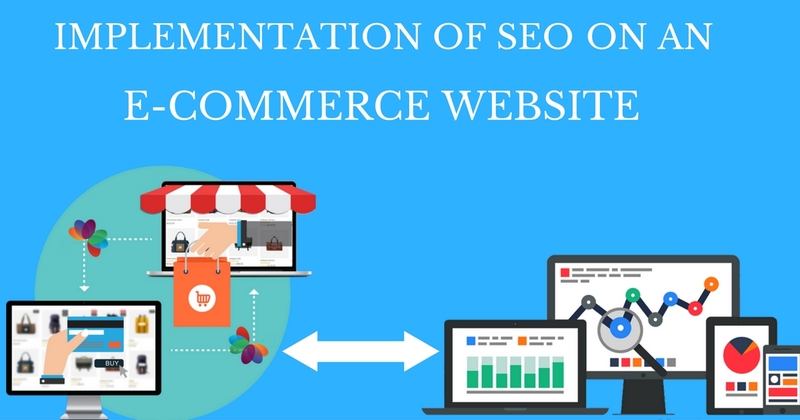 Let us see an overview of the process of getting traffic from free, organic, editorial or natural search results on search engines in simple words “SEO” for an E-commerce website. SEO matters a lot for E-Commerce websites, reports say that 44% of people begin their online shopping experience with a search engine and 30.5% of all traffic to e-commerce sites comes from search engines. As you can see, it is almost impossible for e-commerce business to survive today without SEO. To run an effective SEO campaign, make sure to kick things off with keyword research. You must create a targeted keyword list. Pick long-tail commercial intent keywords. You can generate 20,000 organic searches per months to your site by targeting long-tail keyword phrases and writing quality content around them. Forget short tail keywords and focus on long-tail keyword terms. Your results will be amazing if you stay consistent. There are 2 categories that all the keywords fall into: Keywords with Informational intent and those with Commercial intent. The product name keywords we researched above show commercial intent. These searchers want to buy not immediately but eventually. Pick long tail keywords from tools like Google keyword planner. Informational keywords are necessary to teach, educate, inform and warm up your customers by writing blogs.You need to write a blog post using a keyword that you focused on for one of the pages on the main portion of your website. List each page of your website on a spreadsheet with the keywords you are trying to rank for. While sorting the keyword column, take care that doubling of exact keywords are not there. You must know the necessary things that has to be done to stay different from the competitors. Visitors will not hang around and wait for a slow website to load. They will click back to Google to find a faster website, which can likely become a competitor! In fact the research shows that 40% of people abandon the site that takes longer than 3 seconds to load! Don’t risk to lose customers because your site is slow. You can check the speed of a website using a free tool like Pingdom. Canonical tags are important for E-commerce when products have attributes such as various sizes, colors, quantities, etc. It is also necessary that you don’t accidentally create a script that associates a canonical tag back to every individual page. This is used to prevent scraping, so that content always resides towards the original author’s work. Breadcrumbs are links that allow the user to track their path from the page they are currently viewing to the home page of your website. They appear close to the top of your page and reflect the structure of your site. They help the customers to identify where they are located. Especially for E-commerce websites where there could be many categories and web pages breadcrumbs are necessary for easy navigation. Now a days many people are making purchases through mobile devices, which means it is really important to have a mobile-friendly version of your website.58% of mobile users expect mobile sites to load as quickly or faster than desktop sites. Any e-commerce site would not be complete without social media. Social media targets growth of your community, engagement with customers and sharing of content. Having a lot of social signals tells Google that people find your website and brand valuable. Having a lot of social signals tells Google that people find your website and brand valuable. You can grow your social signals quickly by adding social media buttons to your web pages of product, blog posts and homepage. Rich snippets are HTML coded bits that tell search engines what people who search be able to understand about your website before even clicking to see it. There are types of rich snippets for authors,business information,events,music,products,reviews,albums,people and videos. Google will penalize your site if a lot of low quality sites are linking to you. Referral traffic also will not do anything useful to your business.Focus on earning links from really good, high authority sites by offering something of value to them in exchange for a link. You can do this by offering a high quality guest post, providing a quote for a story, co-authoring a research study and so on. Try using a free service like HARO (Help a Reporter Out) to find press opportunities. Apart from Press mentions, Strong content which we use in general, we can use Broken link building. Updating the site maps help you to identify issues within a particular area of the site and have separate sitemaps for video, images and mobile as well. It is really important for SEO that makes your site visitors happy, provides good user experience and help. This will increase the engagement of user on your site. This includes ensuring a quick and smooth checkout process, giving your visitor quick ways to contact you and ensuring your site loads quickly. Using a live chat widget would be great. Linking pages of your website to other pages within your website is called Anchor linking. It can help you with ranking for your top keywords. But beware if you pack all of your pages with internal links, Google will think you are trying to do something suspicious. Get photographs that create an atmosphere, that make users feel something. Those will make more sales. File name, alt text, caption, etc should be short and yet descriptive. These are opportunities to provide search engines with clues as to what your image content is. SEO is not static nor is your E-commerce website. Use a wise strategic SEO frame work to ensure that everything is in sync with your economic and strategic goals. Just monitoring data is not enough. You must identify the actionable items to keep improving. Spot problems with indexing, duplicate content, manual penalties from Google and more and fix them. Tools like Moz, Search metrics and others help you to identify problems and offer suggestions to fix them. Set up actionable reporting. Each tool has its unique advantages. Pick one product segment that is important to you and perform analysis within specific categories and sub categories. Product reviews increase the e-commerce conversion rate by 14-76%. Customer reviews have positive impact on your SEO. There is no doubt that SEO work requires a lot of time and dedication, but the benefits are worth it. Hope the guide above will help your SEO strategy to boost the sales for your e-commerce site. To learn much more about SEO strategies on different platforms, join Digital marketing course at Digital nest.